UK-based separatist group Sikhs for Justice had organised an event to call for the so-called ‘referendum’ for the separation Punjab from India at London’s Trafalgar Square. According to reports, some pro-Khalistani groups and individuals had gathered there to hold the ‘London Declaration’ for the referendum in 2020. However, many Indians also gathered to hold a counter-protest and displayed their open support for India’s sovereignty. Pakistani born Nazir Ahmed was one of the foremost speakers in this “event”. He has a long history of stoking tension against India. According to reports, many Indian-origin people came out to support India and seen opposing the event was backed by Pakistan’s ISI. In India, the Shiromani Akali Dal has stated that the number of Indian Sikhs participating in the pro-Khalistan event is minuscule and Sikhs are loyal Indians. While the fervour of Indians abroad was being discussed, Hindustan Times decided to take a completely different route. 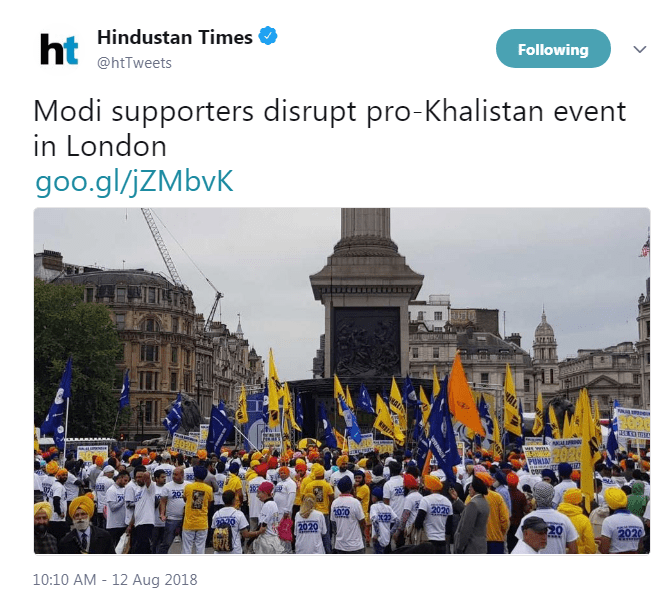 Though HT has mentioned in their article that the pro-Khalistan side was backed by Pakistan and includes that Pakistan-born openly anti-India politician Nazir Ahmed was one of the speakers at the event, its Tweet sharing the article branded Indians opposing Khalistani slogans as ‘Modi Supporters’. HT’s branding of Indians opposing Khalistani separatists as ‘Modi Supporters’ is being questioned on social media. Veteran journalist Kanchan Gupta said that pro-India group took on the pro-Khalistan group. He quipped that Hindustan Times seems to have misspelt pro-India as pro-Modi and the tone is accusatory. He also said that whoever handles the Hindustan Times social media account seems enraged that a pro-Khalistan rally was disrupted. Other commentators too found the tone of the tweet accusatory. Others wondered if opposing Khalistan is a ‘pro-Modi thing’ now. Many Sikhs and other people of Indian origin had planned the event as ‘We Stand With India‘ and have expressed that the Sikh community stands firm in support of India. Chairman of British Sikh Association Dr Rami Ranger had reportedly dismissed the event organisers as ‘a handful of unelected and self-appointed Sikhs’. Pro-Khalistan voices have found a ground in the UK even before. During the Republic Day event in the Indian High Commission in London this year, Pakistani born British politician Nazir Ahmed had instigated pro-Khalistan and anti-Indian protests. During that event too, Indian origin people had gathered to oppose anti-Indian elements and there were even clashes reported between the two groups. At that time, the anti-Indian gathering was backed by Pakistan born British politician Nazir Ahmed. Separatist groups supported by Pakistan had indulged in anti-India sloganeering and held events during PM Modi’s UK visit in April this year too.